An Alford-based food company which is one of the UK’s largest egg producers and packers has been named Rural Business of the Year at the annual Amazon Growing Business Awards. LJ Fairburn & Son was crowned the winner of its category at a showpiece ceremony in London on Wednesday evening (28 November) after competing against companies from across the UK for the top prize. The Amazon Growing Business Awards, which celebrates 20 years this year, are the UK’s most established and respected recognition of SME and entrepreneurial success. The awards were created by Real Business and backed by the CBI. Along with LJ Fairburn & Son, 16 other businesses from across the country were recognised for their successes in a range of different categories. “For over two decades the Growing Business Awards have spotted real raw talent and growth potential in businesses of all sizes and helped propel them into the limelight. This year is no exception. The winners are all true leaders in their own right, heading up true growth businesses with limitless potential.” added Praseeda Nair, editorial director, Real Business. This year’s winning businesses come from a range of industries including design, manufacturing, travel, healthcare and retail. They join a prestigious list of businesses who have gone on to further successes after competing in the Amazon Growing Business Awards. Companies like Revolut, Go Ape, Innocent Drinks, Betfair and Fever-Tree have become household names. 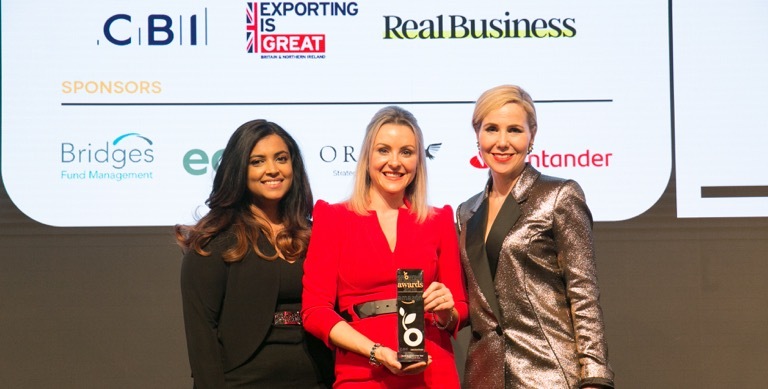 Picture shows left to right: Praseeda Nair, Editorial Director, Real Business; Sarah Louise Fairburn, Brand & Sales Director, LJ Fairburn & Son; Awards Host, Sally Phillips.